Would You Buy Ordinary Gum Just Because It Supports a Cause? It's something that comes up again and again. Will consumers buy a product or use a service just because it supports a cause? I don't buy it, and fizzled experiments from Causeon to Edun to CauseWorld to GoodSearch show that while consumers do indeed want a world with causes, a cause world is a different matter. Brand and margin lead (e. g. Groupon, The Gap, Foursquare, Google) and mission follows. I believe the best way for a business to help a cause is to first be a great business. It's like before takeoff when the flight attendant tells you if the oxygen masks drops from the top of the cabin you should put it on yourself first before trying to help anyone else with theirs. But Project 7 is betting that something as mundane as chewing gum will succeed because it's all about helping others first. As reported in Good, this gum is ordinary. 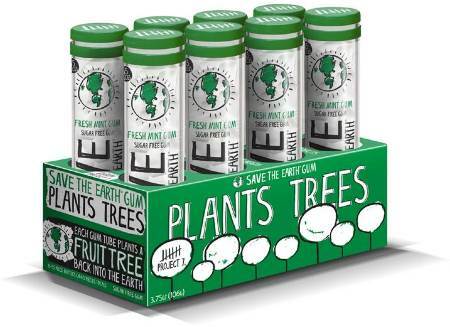 They even recently changed the ingredients so it will taste like every other stick of gum, which may increase sales but it got Project 7 booted from organic-only Whole Foods. So taste, cost and placement near the rest of the candy is all the same. But this gum benefits a variety of good causes that feed the hungry, heal the sick and save the earth. The can't miss cause packaging says it all. Which is why Project 7 is expecting this gum to stick. Everyone points to Newman's Own as proof that cause products such as Project 7 can be a big success. But that's like believing your organization can have its own national telethon because Jerry Lewis had one, or that you can partner with some of the best businesses in the world because Product Red does. It's just not that simple. You have to compare apples to apples. Even Product Red may be a one-hit wonder. When U2's Bono and his wife put their stardom behind fashion-for-good line Edun it flopped, highlighting that even rockstars are challenged to put mission before margin and brand. The notable exception is Tom's Shoes. You certainly can't argue against Tom's success (Nor do I want to. It's great.). But Tom's is the exception, not the rule. It's like coming across a blue lobster (chances: 1 in 2 to 5 million) in a sea of red, which is where most cause businesses end up. I'll be watching Project 7 to see if they can make their gum stick. But I've chewed on this one before and I don't think this gum is going to last.